VocApp is a language learning platform that uses flashcards to teach vocabulary. Their effectiveness has been proved by many of our thankful users. We offer great Ukrainian language courses, which will help you learn and practice Ukrainian vocabulary. The flashcards will present your words in Ukrainian, their Ukrainian to English translation, example sentences and Ukrainian phrases for you to learn how to use the words and their basic Ukrainian grammar. Our courses will help you learn to speak Ukrainian because they include the Ukrainian pronunciation. After some effort and time, you will start forming your own Ukrainian language phrases. 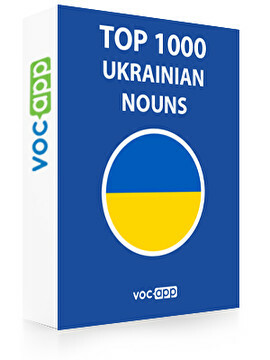 Learn Ukrainian language with VocApp and impress your family, friends and the natives! A great way to learn Ukrainian language fast is to learn and revise the vocabulary given in our flashcards. As some of the most important Ukrainian words are nouns, we've prepared an entire course dedicated to them! You will learn all of the most common nouns in one course! Moreover, you will strenghten your Ukrainian grammar knowledge, learn the Ukrainian pronunciation of the nouns and enhance your Ukrainian vocabulary! There are many more Ukrainian language courses we offer, for example Ukrainian Words: Top 500 Verbs and Ukrainian Words: Top 300 Adjectives! Don't forget to take a look! Learn Ukrainian language fast and remember new words forever!